Come on, let’s have fun together. Located in the Solar Arts building, Indeed Brewing has great taproom filled with a welcoming wood bar, tables, chairs and booths. Their 2 year-round beers are companied by a number of seasonal brew in addition to a cask ale or two and generally an infusion. Select from 10oz, 16oz, or 20oz pours for a glass that matches your thirst (some seasonals are not available in larger pours). There is a parking lot at Indeed although it fills fairly quickly and can be difficult to get in and out of when full. There is plenty of parking on NE 15th Ave and Quincy St. NE. Yes. 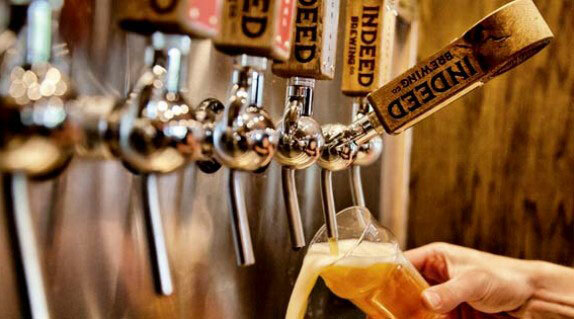 Indeed sells 750ml bottles of many of their brews and recently started selling growlers in the taproom also. Grab a couple during normal taproom hours (10pm cutoff for growler sales at all breweries in MN). Because this is Minnesota, they must be Indeed Brewing labeled growlers and they cannot fill anyone else’s growlers. Yes. There are food trucks to fill your belly at Indeed every day. For a full schedule of which truck will be at the brewery each day, check out the calendar on their website here. For more information on Indeed Brewing, checkout their website.